Bypass local Honduras telecommunications systems and take advantage of our high quality international conference call bridge connecting your Honduras meeting to any other team of participants, in any country. To use this service, the conference call participant in Honduras simply makes a call to our Honduras toll-free number 800 27919339 and enters a PIN code. The other attendees dial-in from their countries and everyone meets on the call. Conference call participants located in Honduras can utilize the local Honduras toll free access number from their Honduras mobile phones or landline. Honduras has a population of 8.59 million with over half of that population living in poverty. It is one of the poorest nations in Latin America with a high birth rate and a median age of 21.9. Honduras has had its fair share of political and economical instability, both of which have adversely affected the country's telecommunications market. 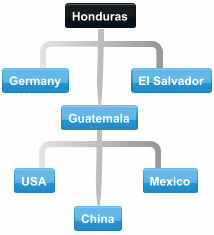 Fixed-line communications in Honduras remains limited with just 610,000 main lines in use as of 2012. Efforts to increase tele density for fixed-line phone service began in 2003 when private operators were authorized to provide service. This took place under the government's "Telephony for All" program where operators could become partners with the state-owned Hondutel. Hondutel was launched in 1976 and remained the state-owned telecommunications provider until liberalization. Liberalization of the country's telecommunications system was a condition of a free trade agreement with the United States (CAFTA). The Honduras telecommunications sector was opened to competition in December 2005. With a fixed line tele density of just 7 percent, Honduras lags behind the average for other Central American and Caribbean nations. Rugged terrain and low levels of infrastructure investments further compound the problem, particularly in rural areas where it is both impractical and unattractive to invest in infrastructure. As a result, Honduras' Internet growth has been slow. As of June 2012, Honduras had just 1.3 million Internet users which is just under 16 percent of its population. As far as broadband Internet service goes, roughly 64,000 users subscribe to fixed broadband service and about 347,000 subscribe to wireless broadband service. Though high speed Internet service is available in some parts of Honduras, it is limited to major urban centers. Like many other nations, Honduras has many more mobile cellular subscribers than fixed line phones. As of 2012, Honduras had 7.37 million mobile phone subscribers for a mobile phone tele density of roughly 100:100. The first mobile telecommunications provider in Honduras was Celtel (Tigo) which arrived in Honduras in 1996. Other providers include: Megaton (Claro), Honducel, and Digital (América Móvil). Honduras serves as a landing point for two fiber optic submarine cable systems the Americas Region Caribbean Ring System and the MAYA-1. These systems connect Honduras' telephone network to Central and South America, the United States, and parts of the Caribbean. The nation is also connected to the Central American Microwave System and is home to two satellite earth stations. Despite its poor telecommunications infrastructure, Honduras has one of the lowest telecom cost per megawatt in the region, about 40 percent less than Costa Rica and Guatemala. If you have business associates, partners, colleagues, or loved ones in Honduras, holding an international conference call is an excellent way to communicate with a group. International conference calls can be initiated from Honduras as well as from any other country. Participants from Honduras can be given a Honduras toll free number to access the global conference call. This helps to eliminate concerns about the cost of the call as well as confusion about dialing a foreign phone number. When using our international conference calling service, the calls are routed over a high quality, traditional telephone network. This ensures crystal clear sound quality and reliable connections - even when callers are located in countries with notoriously unreliable telephone networks. Participants in an international conference call can dial into the conference using virtually any phone available including fixed line phones, mobile phones, VoIP phones, and Skype. Note that the cost of an international conference call is based several factors including the country, phone type, toll free or direct access, dial-out or direct dial, and the number of minutes used per person. Several useful international conference calling options are available including moderator dial-out and MP3 call recording. With moderator dial-out, the moderator of the global conference call can call individual participants directly and patch them into the conference. This often results in a lower cost per minute compared to toll free access. However, it does depend on the rates for each specific country. Moderator dial-out is a good choice when toll free access is not offered for a participant's country. To initiate dial-out, press *1 during the conference call and then dial the participant's phone number. Once the participant answers, press *2 to merge the calls. MP3 call recording is useful for an international conference call where some participants may not be able to attend the call in person. For example, if some of your colleagues in Honduras cannot participate in a global conference call due to time zone differences or schedule conflicts, you could send them an audio file of the call after the fact. Many businesses use MP3 recordings of their conference calls for training purposes. Others use them to document their meetings while others have their recordings transcribed so that they have a text-based document of the call. Whether you're located in Honduras or a participant of an upcoming global conference call is located there, holding an international conference call is an affordable way to communicate despite the poor condition of the local infrastructure. As an example, now your client in Honduras can join a conference call with a marketing VP located in San Francisco, USA or Germany, El Salvador and add other guests in China and Guatemala, all on the same call. You can be the chairperson in Honduras and attend or host conference calls with participants in any other country. Optionally the Honduras chairperson or attendee can use the web 'Connect App' feature to trigger a callback to his/her phone to enter the Honduras conference call. Antigua, Argentina, Australia, Austria, Bahamas, Bahrain, Barbados, Belarus, Belgium, Bermuda, Brazil, British Virgin Islands, Canada, Chile, China, Colombia, Costa Rica, Cyprus, Czech Republic, Denmark, Dominican Republic, Ecuador, Finland, France, Germany, Greece, Honduras, Hong Kong, Hungary, India, Indonesia, Ireland, Israel, Italy, Jamaica, Japan, Korea, Luxembourg, Malaysia, Mexico, Montserrat, Netherlands, New Zealand, Norway, Panama, Poland, Portugal, Puerto Rico, Russia, Saudi Arabia, Slovakia, Slovenia, Singapore, South Africa, Spain, St. Kitts/Nevis, St. Lucia, St. Vincent, Sri Lanka, Sweden, Switzerland, Taiwan, Thailand, Trinidad, Tobago, UAE, UK, Uruguay, Venezuela, Vietnam. plus any other city that can access the in-country toll-free Honduras access number. Honduras conference calls are easy to host from any city in Honduras. Host or attend Honduras international conference calls utilizing the Honduras toll-free access number included with your new account activation. We provide in-country toll free numbers in over 100 countries. MP3 recording makes it convenient to retain audio files of international conference calls.